Despite the increasing popularity of wedding websites, quite a number of people are still not conversant with these types of websites. Just like it is always important to know the products you are buying before hand, you should also be acquainted with the basics of a wedding website before opting for one. Generally, a wedding website is like a personal blog but, specifically meant for couples who are already engaged and, planning for a wedding. The basis of creating the platform is to help with planning and communication for all the activities related to the occasion. Setting up a wedding website will give you a lot of easy time when it comes to the planning for the wedding. Through the website, you can easily send out invitations and, receive responses from different guests faster and, in real time. Besides, the website also offers you an adequate platform to post all the information about the wedding where all your guests can access them at their own convenience. Even if you may want to make changes to the wedding plan later, the information can be simply posted therein for all guests. As a result of this, you will not be bothered with making numerous calls or sending messages to each and every guest expected to attend. A wedding website will also enable you to easily manage the guest list, gift list and even develop the entire layout for the event from your comfort zone. The site ensures that you can conduct all the activities related to the wedding from a single platform for convenience. With a custom wedding website, you will not even need the services of a wedding planner. Since you can also communicate with your guests via the website, there will be no need for sending out wedding cards, which could significantly reduce the overall costs of the wedding. By clearly giving details about the schedule and location of the wedding on your website, you will not have to make several calls giving directions and confirming reservations. Reduced phone calls will also help with keeping your expenditure on the low. On the other hand, a wedding website is created and built based on the specific expectations of every couple, which means you only pay for what you get. A wedding website is an ideal platform for you to start building excitement on the part of your guests before the big day. Apart from just designing the website to portray the theme of your wedding, you can also add content that specifically tell the story of your relationship. 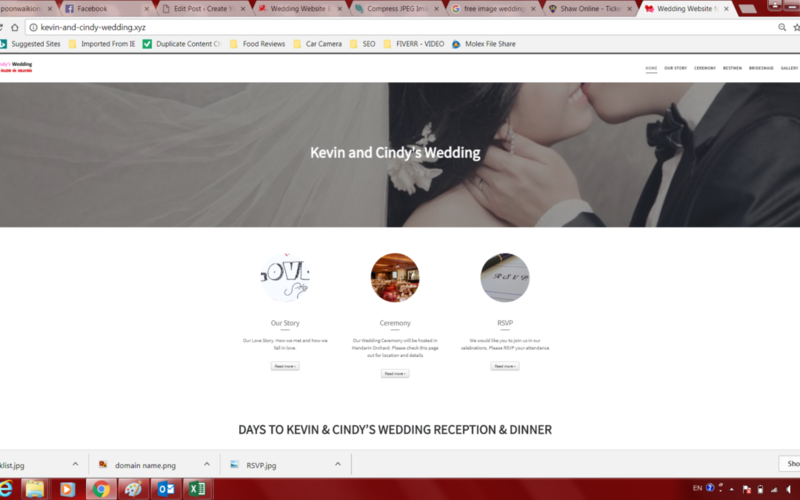 Simply talk to Wedding Website Singapore for a custom wedding website. We can create the best wedding website to make your day a success.